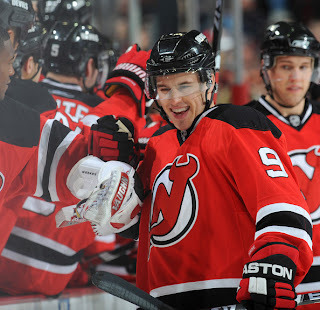 Earlier today the New Jersey Devils and star forward, Zach Parise, came to terms on a one year, $6 million deal, that will keep the two parties away from an arbitration meeting that was scheduled for August 2nd in Toronto. “So, really what we have done is avoid arbitration by settling on one year with the understanding and intent to take whatever time is necessary to get a long-term deal.” Devils GM Lou Lamoriello said in an interview with David Gulliti of "Fire and Ice" regarding Parise's one year deal. It makes sense. Parise would have become and unrestirced agent on July 1, 2012 no matter what if the two parties made it to arbitraion. Now with this deal in place, they do not have to rush into signing a deal due to a looming deadline. The Devils' Organization and Parise's agent now have all the time in the world to come to terms on a long term contract. Parise has stated on many occasions that he wants to play in New Jersey, this deal will allow him to get the right contract to keep him there without worrying about hitting the UFA next season.